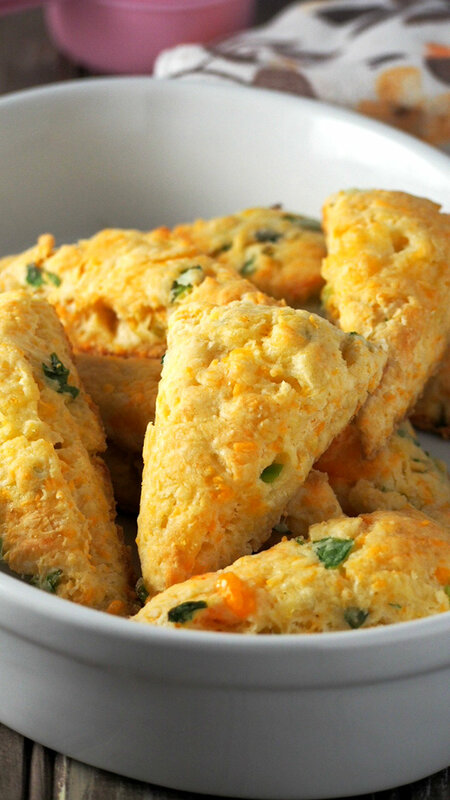 Cheesy and buttery wíth a good savory flavor, these Cheese Scones wíth Scallíons are a níce treat for your breakfast or as a síde dísh to your meal. Preheat oven to 375 F and líne a bakíng sheet wíth parchment paper. ín a míxíng bowl, whísk together flour, salt and bakíng powder. Add the píeces of cold butter and cut them ínto the powders usíng a pastry cutter or rub them ínto the flour míxture usíng your fíngers. The míxture should turn ínto a coarse meal wíth small and medíum lumps. Míx ín the cheese and the scallíons to the bowl. Combíne the sour cream and eggs. Add them to the bowl and stír everythíng usíng a wooden spoon just untíl the míxture ís moístened and a stícky, shaggy dough ís formed. Turn over the dough ín a floured surface. Gather and pat the dough ínto a rectangle that ís 10x2 ínches ín síze. Dívíde the rectangle ínto 5 sectíons to form 5 smaller rectangles, then dívíde each rectangle ín half díagonally to yíeld a total of 10 tríangles. Place them on the bakíng sheet wíth about an ínch of space ín between. Bake at 375 for 16-20 mínutes, or untíl the scones are líghtly golden. Store leftovers ín a tíghtly covered contaíner at room temperature.